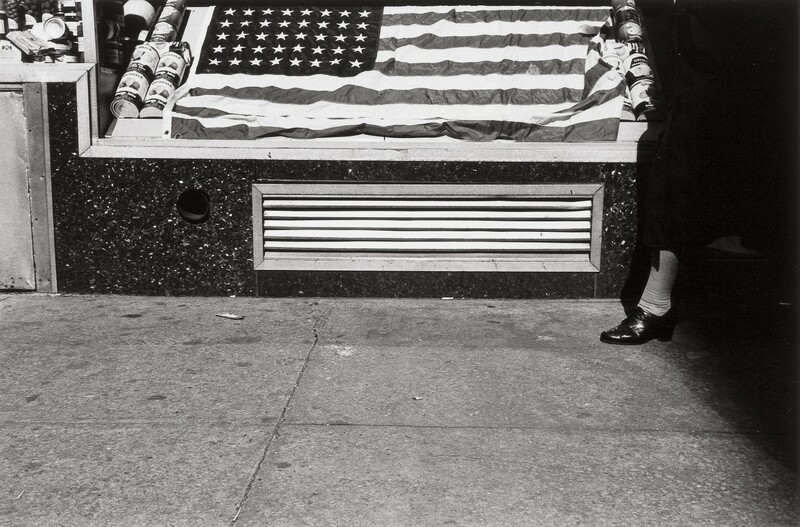 Friedlander’s work provides some of the first and best examples of what has become a widespread approach to photography. It was part of the general reorientation of the sixties within American art. Within photography his work violated the dominant formal canons not by inattention but by systemic negation. 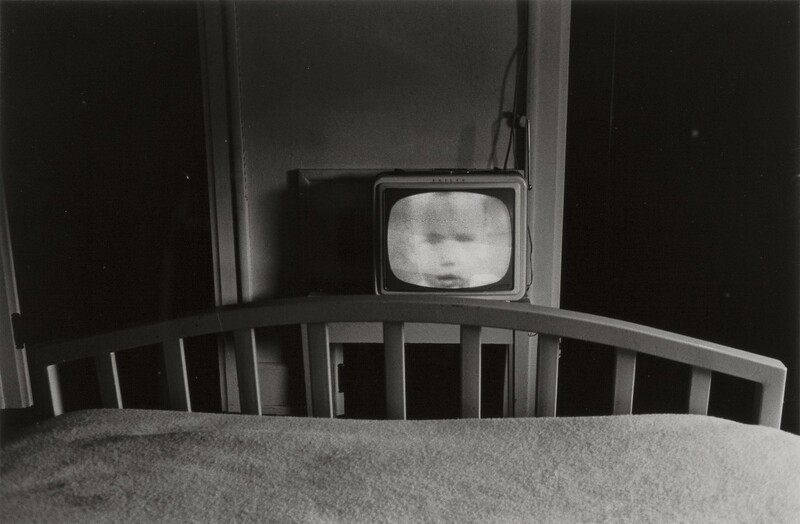 Quite a few of the photos in the recent show had appeared either in Friedlander’s book Self Portrait or in the joint Work from the Same House, which coupled Friedlander’s photos with hairy, somewhat pudendal etchings by his friend Jim Dine. The ones exhibited at the Modern were those closest to elegance, geometry, cleanness, and high-quality camerawork, and, among the humorous photos, those displaying pure-minded irony and wit untainted by lowness or sexuality, which the book done with Dine had plenty of. All the rawest photos, in both subject and handling, were absent. In moving toward vernacular photo images, photography has had to confront some of the issues behind realism, such as whether a photograph is in any sense a document and, if so, what kind. Is it “about” what it shows concretely, metaphorically, representatively, allegorically? 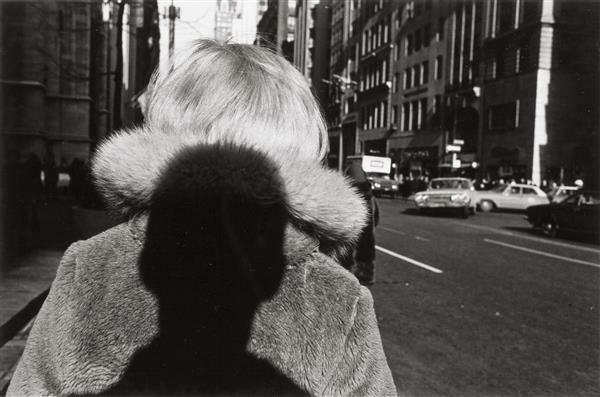 Friedlander’s work provides some of the first and best examples of what has become a widespread approach to photography. It was part of the general reorientation of the sixties within American art. Within photography his work violated the dominant formal canons not by inattention but by systemic negation. High-art photography had had a tradition of being directed, by and large, toward some universal message. It had aimed to signify a transcendental statement through subtraction or rationalized arrangement of elements within the photographed space, dramatic lighting, expressive intensity of glance or gesture, exotic or culturally loaded subjects, and so on. 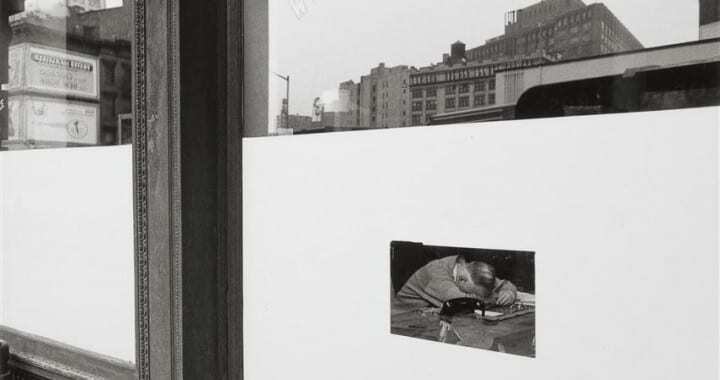 If Friedlander uses these devices, it is only to subvert them, to expose their arbitrariness. 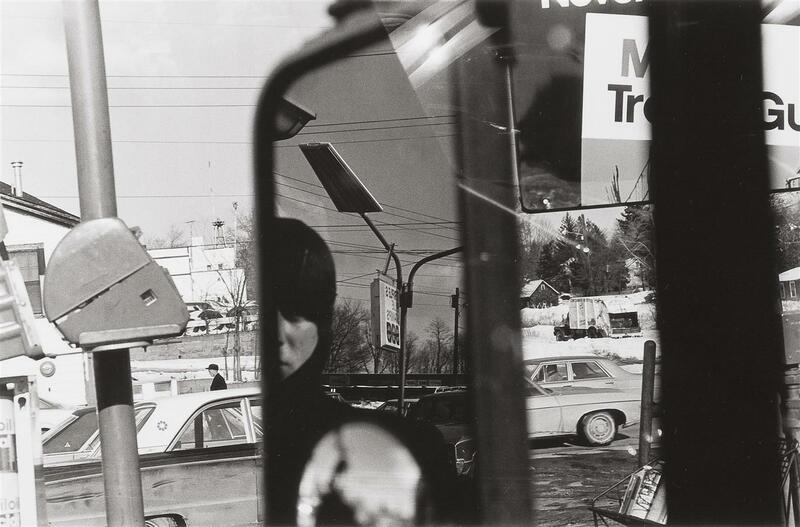 But in shifting the direction of art photography, Friedlander has not rejcted a transcendental aim – nor has he specifically embraced one. Instead his attention is on the continuum whose poles are formalist photography at one end and transparent, or information-carrying, photography at the other. Imagine a mapping system for photographic messages: The continuum formal versus transparent is perpendicular to the continuum transcendent versus literal. (A photo of a fiery helicopter crash in combat, for example, is “transparent” and literal when it functions to document the particular crash; it is moved toward the formal if the style of the photograph or the oeuvre of the photographer becomes an issue, but it may still be a literal document. It is moved toward the transcendent range of meaning if it is taken as embodying a statement about, say, human inhumanity, heroism, or the tragedy of war, and into the formal-transcendent range if its efficacy as a bearer of this message is held to lie with its formal rather than strictly denotative features.) Without insisting on this device, we can observe that even if an artist locates his work near the formal end of the one continuum, his messages, no matter how commonplace or “vernacular” are still free to wander anywhere along the other, from literalness to transcendence. In moving toward vernacular photo images, photography has had to confront some of the issues behind realism, such as whether a photograph is in any sense a document and, if so, what kind. Is it “about” what it shows concretely, metaphorically, representatively, allegorically? Does it refer to a moment alone? If so, how long a moment? Does it reveal only that moment, or does it indicate past and future as well? Or is it a record of sensibility, or is it most specifically about photography itself? There are metacritical questions about the range of messages a photo can convey as well as about how it signals what it signals. 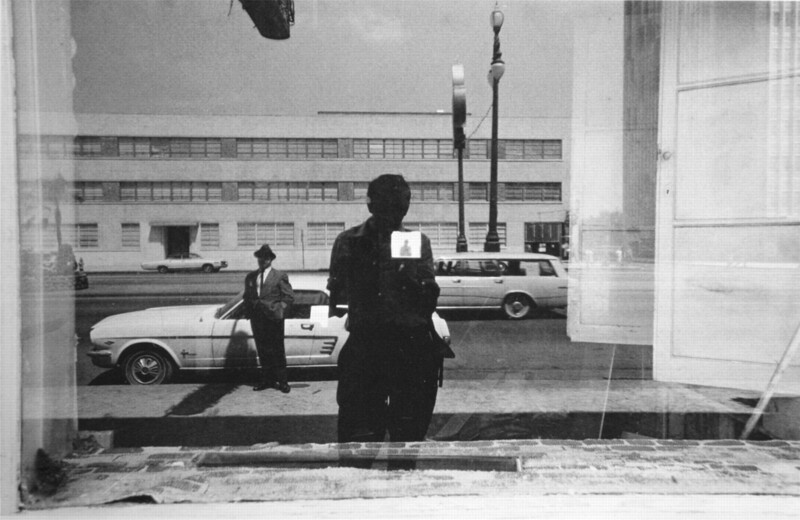 These questions are both contentual and formal, and they are all at issue in Friedlander’s work. The meaning of a photographed instant is pivotal, though the problem is not flamboyantly explored. 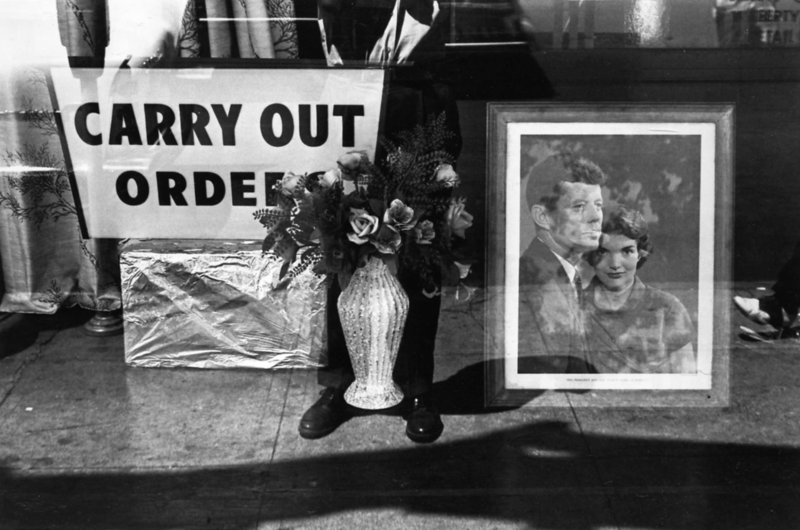 Among the reasons why it is unwise to compare Friedlander’s photos to “snapshots”, the most telling may be that they are not commemorations of a moment; once you have seen more than one, his critical concerns clearly emerge. His conscious presence assaults the notion of transparency, breaking our experience of the moment photographed while at the same time alluding to it. 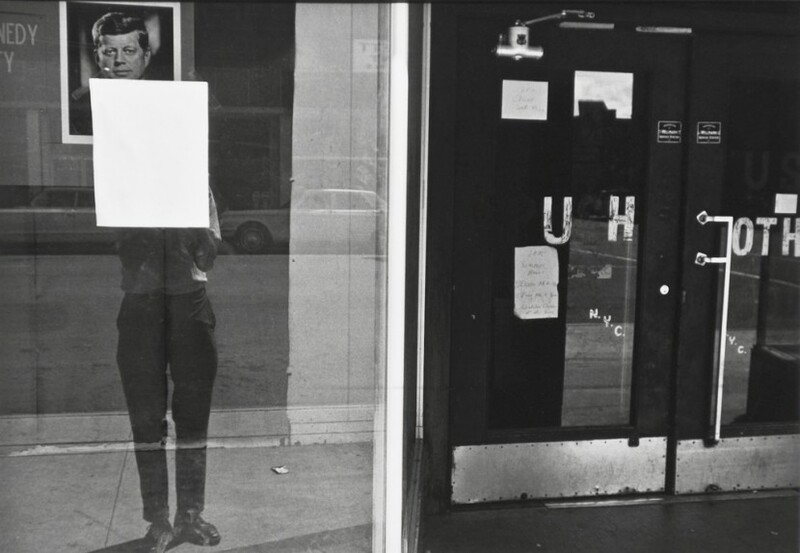 Whereas the photos display the look and the subjects literal and transparent photography, Friedlander’s use of these commonplace features shifts their meaning to another plane. Posted in Artist Short List, Essays, Highlights and tagged Documentary Photography, John Szarkowski, Lee Friedlander, Martha Rosler, MoMA, New Documents, Self Portrait, Street Photography, Vernacular.